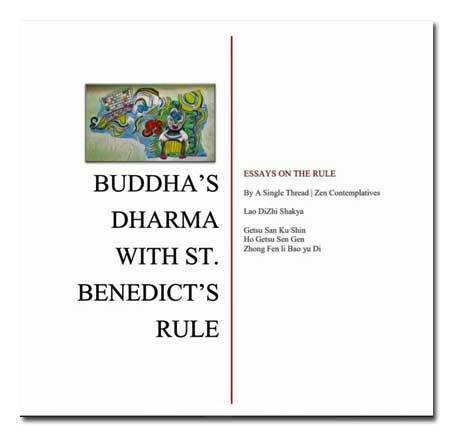 In 2001, Monastic Inter-religious Dialogue (MID) sponsored a Buddhist-Catholic conference to celebrate the publishing of 'Benedict's Dharma'. Monastics and lay arrived in Indiana to share and dialogue on the 'Rule of Saint Benedict' and in the years following more conferences were planned and completed with skill and enthusiasm. In 2010 the MID website was retired and access to a good many conference documents were lost to the general public. Buddhists and Christians have lived among each other from the early years of Christianity. Small communities of Christians existed in India, possibly as early as the first century C.E., and certainly by the 7th century, at which time there was also a Christian community in China, but records of dialogues between these communities have not come to light. A new openness towards other religions in Catholicism, promulgated by the decree, "Nostra Aetate," (Declaration on the Relation of the Church to Non-Christian Religions) of the Second Vatican council in 1965 set the stage for real dialogue between Buddhists and Catholics. The Buddha: the "Awakened One." born Siddartha Gautamma, a prince of the Sakya clan in northern India, c. 624 B.C.E. Through his own efforts he achieved Enlightenment, the realization of ultimate reality (truth), perfect in wisdom and compassion. He set the Wheel of the Dharma in motion, showing all humankind (and ultimately all sentient beings) the way to attain release from suffering and attain Nirvana, that ultimate state beyond all description. The Christ: the "Messiah," or "Anointed One," born Jesus of Nazareth in Judea; crucified outside of Jerusalem by Roman authorities, c. 33 C.E. Anointed by God to save humankind by death on a cross and resurrection from the dead, God became human so humanity could be divinized. He was the total and complete manifestation of God, the Son of God, the second person of the Trinity. 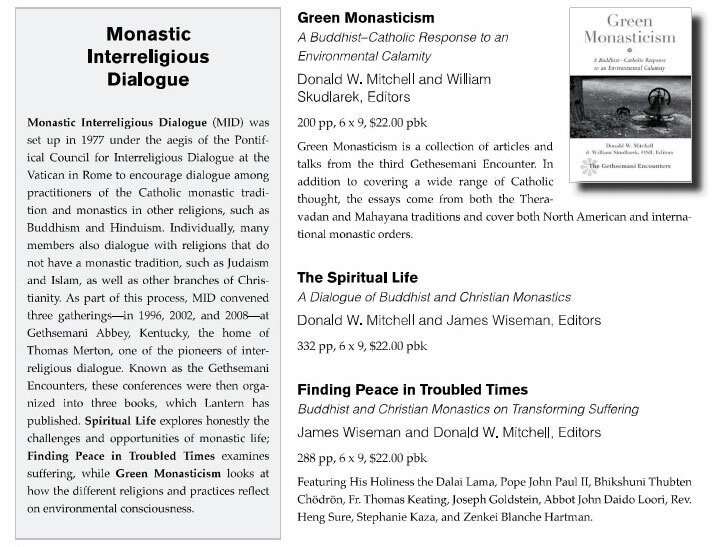 Monastic Interreligious Dialogue - Is a board of Catholic monastic religious from the Benedictine and Cistercian orders, as well as an advisory board drawn from experts in religion from academia and other religious traditions such as Buddhism. 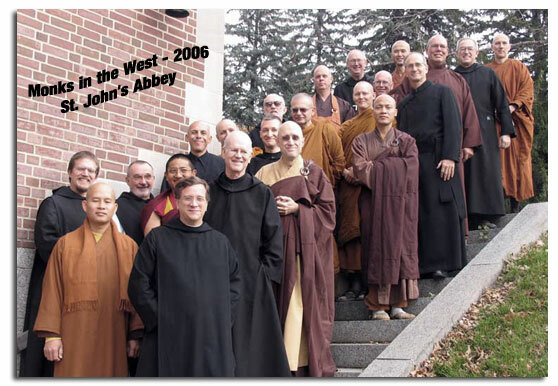 The purpose of MID is to foster dialogue with the monastic traditions of other religions, in particular Buddhism. In Rome, the fiftieth anniversary of the promulgation on October 28, 1965, of Nostra ætate, the Second Vatican Council’s Declaration on the Relation of the Church to Non-Christian Religions, was especially marked by the general papal audience on October 28, 2015, and by an International Congress organized by the Pontifical Council for Interreligious Dialogue in collaboration with the Commission for Religious Relationships with Jews, the Pontifical Council for Promoting Christian Unity and the Pontifical Gregorian University. The Secretary General of DIMMID, William Skudlarek OSB, was invited to offer a word of greeting to the participants in the International Congress, and also to greet Pope Francis personally on behalf of Monastic Interreligious Dialogue. The proceedings of the congress will be published in a future issue of Pro Dialogo, the journal of the Pontifical Council for Interreligious Dialogue. The address given by Pope Francis at the general audience and well as photos from the conference and an order form for a video produced by the PCID marking 50 years of Nostra Aetate can be found on the website of the Pontifical Council for Interreligious Dialogue. “Strangers No More” - The Monastic Interreligious Dialogue (DIMMID) documentary, relates with stunning imagery the relationships Catholic monastics have spent decades fostering with spiritual practitioners around the world. It was filmed in France, Italy, Germany, Morocco, Japan and the United States and shows the exchanges between monks and nuns as they join Buddhist and Hindu monastics and Muslim spiritual practitioners to share daily rituals, sit in silent meditation or prayer with one another, talk about their traditions and practices and form understanding and friendships that transcend perceived boundaries between Western and Eastern faiths. Buddhist-Catholic Monastic Conference / 2015 / Gethsemani 4 / "Spiritual Maturation"
"Links open a new window, close window to return to this page." 01:22 - Benedictine Father William Skudlarek talks about the Monastic Interreligious Dialogue.